School bus companies have one of the most important jobs and biggest responsibilities. They are responsible for transporting children safely back and forth to school. They’re also responsible for updating parents about any delays that prevent their children from returning on time. There are many benefits that GPS tracking has to offer for school buses. They involve the safety of students, peace of mind of their parents and the monitoring of the operation every year. GPS tracking for school buses is about so much more than creating more fuel-efficient bus routes. It also provides a wealth of other benefits that can’t be ignore when it comes to school bus transportation. One of the most important benefits is the opportunity to keep parents in the loop. It is possible to track school bus progress to know when to have children ready in the morning. Likewise, it lets them know when they should be waiting to pick them up after school. It can also be set to send out notifications or alerts to parents if there are delays from traffic, weather, etc. This also extends to allow parents to track buses returning from field trips, sports, band trips, and other events that might occur outside of traditional school hours. This allows parents to know when their children will return and track their progress throughout the experience. Breaking safety rules like speeding, hard braking, etc. places children at risk. The school buses fleet managers are responsible of the safety and security of children, so they need to address the problem promptly. They cannot personally be on every bus to make sure drivers are following these traffic safety rules. They can, however, receive notifications instantly when these infractions occur, so they can address the problem right away. It is possible to improve the maintenance practices of school buses by equipping them with GPS tracking devices. These devices notify managers when scheduled maintenance is needed, which minimizes downtime and costly breakdowns. When buses do need maintenance, fleet managers will be able to accurately schedule replacement buses. By knowing exactly when school buses will arrive and depart, school administrators and teachers can create better and more effective schedules for their students. This allows for better time management and more fluidity of the school day. With GPS tracking devices, routes can be better optimized and engine idling can be minimized. Both of these things reduce the impact buses have on the environment by lowering the amount of emissions they put out into the atmosphere. GPS fleet tracking for school buses can help to improve safety measures and provide parents, educators, and school bus drivers with increased peace of mind. 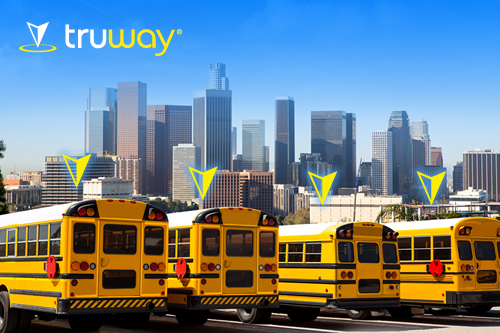 Take advantage of these benefits by installing Truway GPS tracking technology on your school bus fleet as soon as possible. Contact us Here! or call us at +1(786) 808-7892 to learn more about it.